Many ancient peoples used burnishing to make their pottery harder and more waterproof before they discovered the use of glazes. Contemporary potters can also use burnishing to great effect. There is one very important point to keep in mind: burnished pottery should not be used for food or drink, with few exceptions. 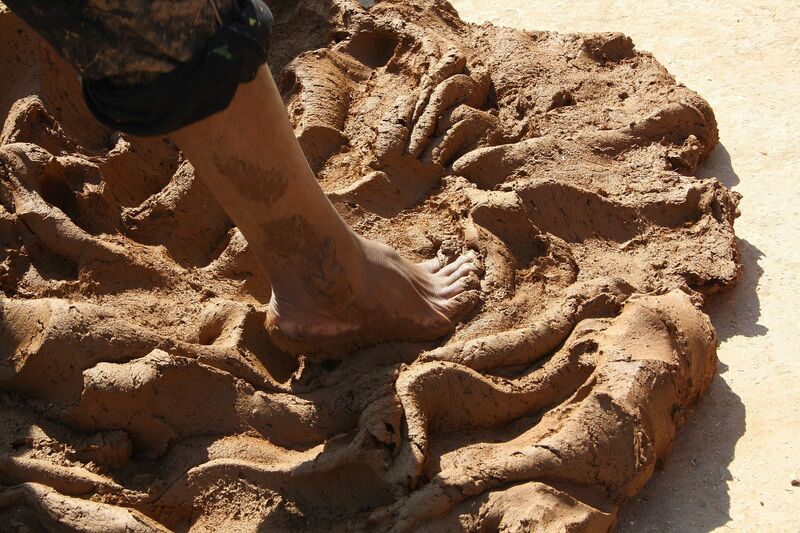 Preparing Clay sand for pottery. Besides texture, you need to also realize that higher temperatures will roughen the outer surface of the pot. The best clays to use, therefore, are earthenware and low-fire clay bodies, whether or not an additional slip is used on the surface. Throwing a pot - early stage. Pots with clean, non-ornamented lines and smooth transitions work best. Otherwise, it becomes very difficult to get to all the areas of the pot to burnish them completely. In addition, fussy and complicated shapes detract from the subtle pleasures of the burnished surface. Tools used to burnish pottery include polished stones, spoons, and even a plastic-covered thumb. The burnishing tools you prefer will depend on how you work and what is comfortable for you. Burnishing tools do need to be hard and very smooth. A jeweler's burnishing tool can be used, but most potters use the backs of spoons and polished stones. After the preliminary burnishing has been completed, you can get an even higher gloss by using your thumb or a finger that is tightly wrapped in a piece of plastic grocery bag (see the photo for an example). Burnishing workshop of the manufacture nationale de Sèvres. Burnishing is easiest when the clay is wet slightly with a lubricant. The lubricant allows the clay particles to lift and be re-deposited in an even tighter (read glossier here) matrix. Although water can be used for this, I greatly discourage you from using it. Water will tend to soak too far into the pot's wall and weaken the structure. Lubricants that work well are vegetable oils, lard, and solid vegetable shortening. I've used oil with good results, but under the intense compression, the clay can flake, especially over any edges that may exist. Solid fats such as lard are said to reduce the occurrence of flaking even more than oil. Burnish pottery using a hard, smooth item such as the back of a spoon or a polished stone. Burnishing is basically rubbing the surface of the pot until it becomes glossy. This requires a lot of patience. Take into account that burnishing even a small pot will take several hours. Work in very small areas, applying only as much lubricant as needed for that section. Lightly apply your lubricant. Begin rubbing the area, applying a fair amount of force but not enough to gouge the pot. You will notice that a thin slurry develops. As you work, the lifted clay particles will settle again, even tighter than before. This produces the gloss. Rub the surface in every direction. Working only in one direction as if you were scribbling on a piece of paper will leave the surface streaked. Instead, change directions every two to three strokes. Items used to seal burnished pottery after firing. Firing gives the burnished pot a lovely, buttery soft feel. In ancient times, animal fat (such as the bacon drippings in the photograph), oil, and wax were often used as sealants to make it more waterproof and to bring the pot back to the pre-firing high gloss. Today, most potters use one form of wax or another. Those doing a lot of burnished pottery usually use automotive wax. You can also use paraffin, candle wax, beeswax, or even a wax crayon (although it will add color). To apply the wax, apply dry heat to a small section of the pot. A hair dryer works exceptionally well. Rub the wax onto the heated area, then polish. I find polishing with a finger covered tightly by a plastic grocery bag works best. Repeat until the pot is done.